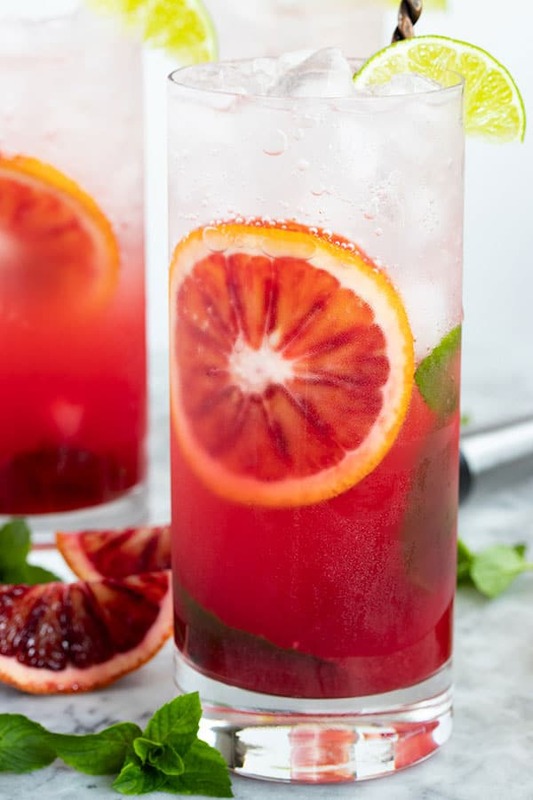 This blood orange mojito recipe is a refreshing twist on the classic mojito cocktail. It’s everything you love about a mojito with an extra hint of fresh citrus flavor. 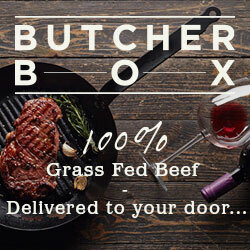 Blood oranges are a delicious variety of oranges with beautiful red and orange flesh, which is how they got their name! They taste something like a cross between a raspberry and an orange and have kind of a short season. I can only find them in the store around me from December to March or so. 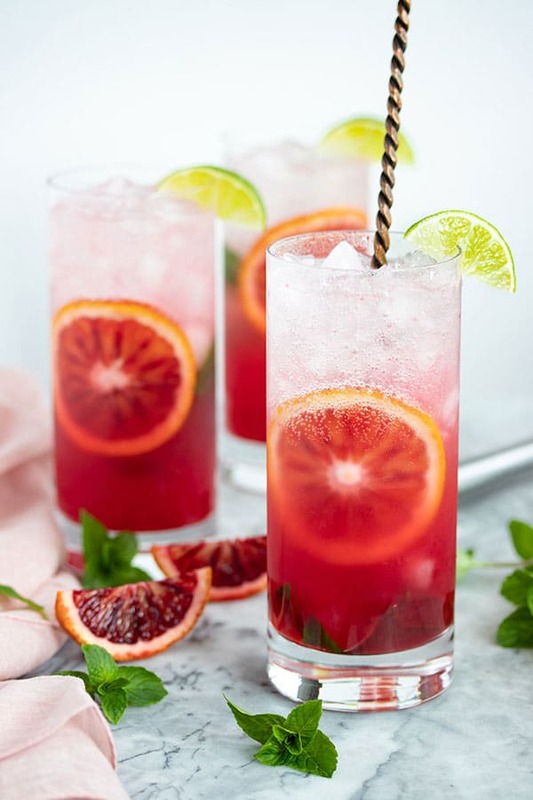 They can be a little more tart than a regular orange, but they taste amazing in cocktails and this blood orange mojito is one of our favorite cocktails to make with them. A simple syrup is just as easy to make as its name implies! There are just a few easy steps. add 1 cup of sugar to 1 cup of water. bring the mixture to a boil and then reduce the heat to a simmer. simmer for 5 – 10 mins or until the sugar has dissolved and the mixture has thickened slightly. You want it to just coat the back of a spoon. You don’t want it too thick. And that’s it! The simple syrup will keep in an airtight jar for a long time in the fridge so we make a bunch and keep it on hand. juice your blood oranges. This little juicer tool works great. So does this one! 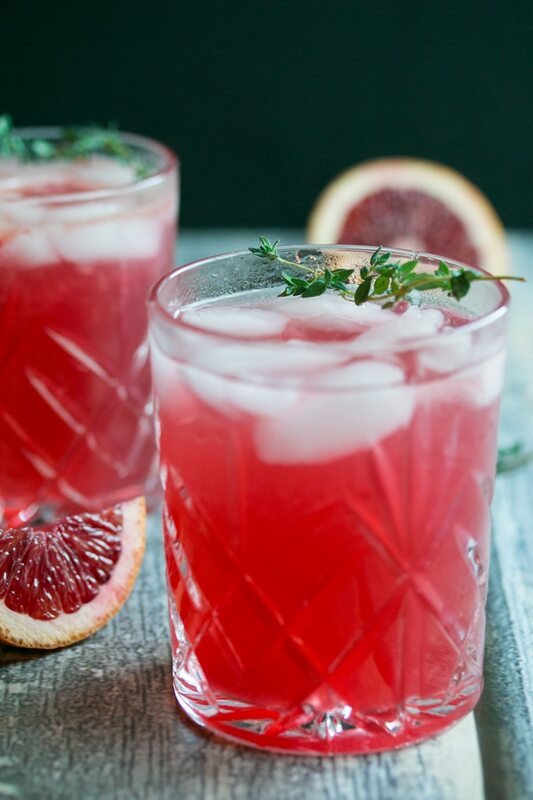 add the rum, mint, and blood orange juice to a glass or cocktail shaker. Smash it up with a cocktail muddler. We love these nice tall highball glasses for mojitos! strain the rum into a glass (if you used a shaker) and add some more mint, the lime juice, and the simple syrup. Muddle briefly again. 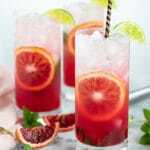 top the mixture with club soda add a few blood orange slices and garnish with a sprig of mint before serving. 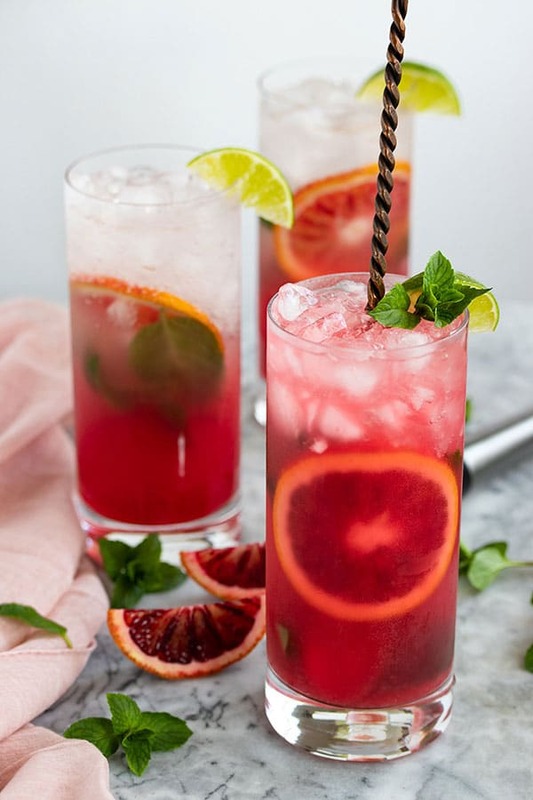 Follow the same instructions for making 1 blood orange mojito, but don’t add ice and don’t add the soda. 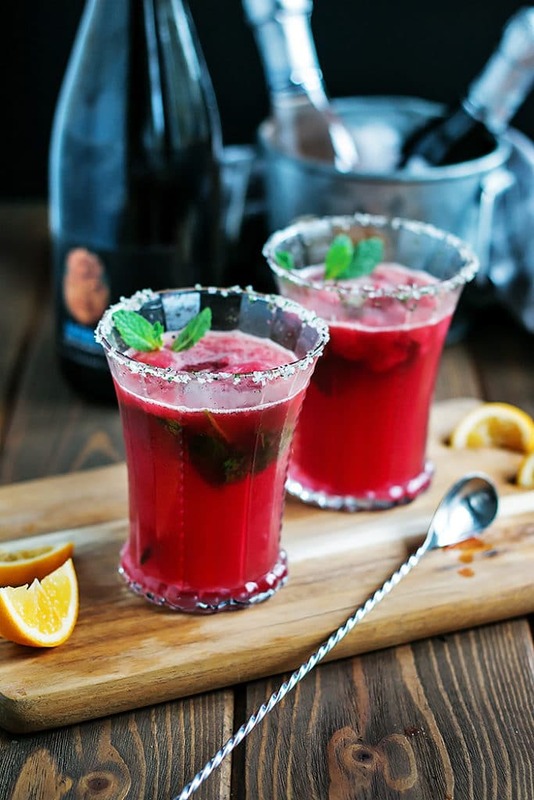 When you go to make your cocktail, fill a glass with ice, then add 3 oz of the mojito pitcher mix and fill up the rest of your glass with club soda. Debbie has this awesome machine for carbonating beverages called a Soda Stream Fountain. She can use it to turn regular tap water into carbonated water. You can use it to make all different kinds of soda with it using a Co2 cartridge. Plus, if you choose to make flavored soda with your Soda Stream, the flavors that they have do not contain high fructose syrup or aspartame. We use Debbie’s Soda Stream all the time as we often like a little bubbles in our cocktails and these kind of bubbles don’t even have calories! I will sure be sorry to see the blood oranges disappear from the produce section. In the meantime however, Debbie and I will be putting this beautiful fruit to good use. Add 1 cup of sugar to 1 cup of water and bring the mixture to a boil on the stove and then reduce the heat to a simmer. Simmer for 5 - 10 mins or until the sugar has dissolved and the mixture has thickened slightly. You want it to just coat the back of a spoon. You don't want it too thick. Juice your blood oranges. Your going to need about 1/2 to 1 orange per cocktail, depending on how juicy they are. 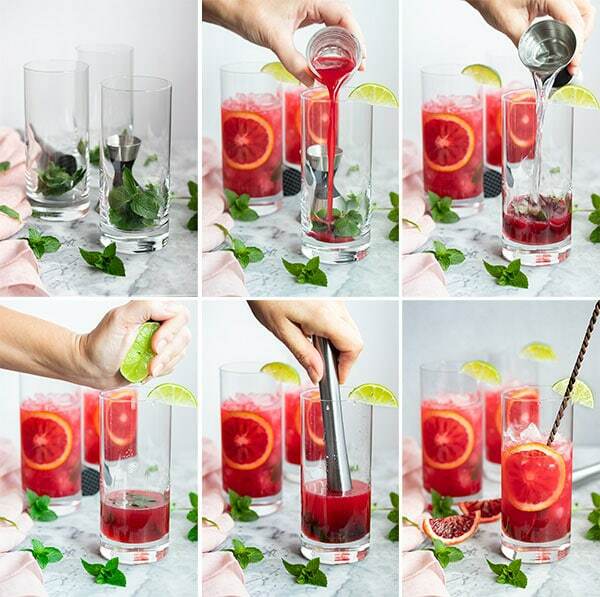 Add the rum, mint, and blood orange juice to a glass or cocktail shaker. Smash it up with a cocktail muddler. Strain the rum into a glass (if you used a shaker) and add some more mint, the lime juice, and the simple syrup. Muddle just briefly again. Fill the glass with ice. 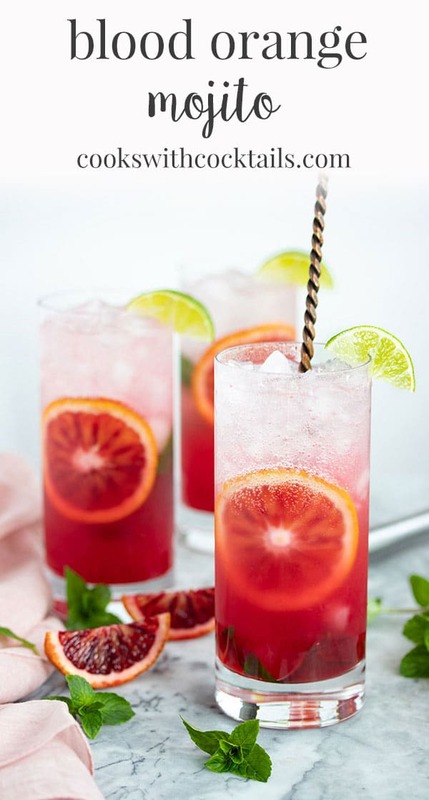 What a beautiful cocktail and yasssss! the mint! Oh the mint! There’s an herb farm a few hours East of where I live.They grow organic herbs commercially and sell locally year round! I’ve been buying mint from them since it stopped growing in my herb pots in late fall. It IS one of my most favorite herbs. I think that’s why I love mojitos so much.. its all about the mint and fruit baby! Love your photograph of the mint and water.. just beautiful! So happy it’s warming up for you! The winter has gone on for what seems like forever! Y’all have a lovely weekend! 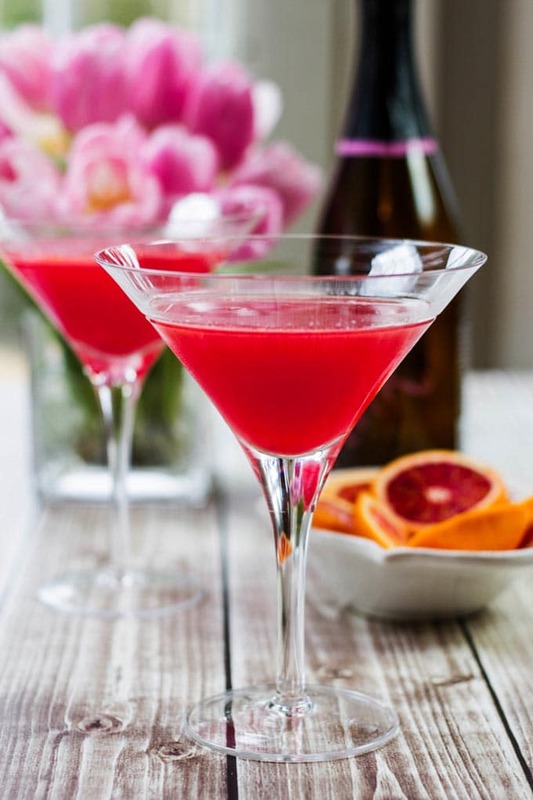 Wish I had one of these cocktails in hand now! 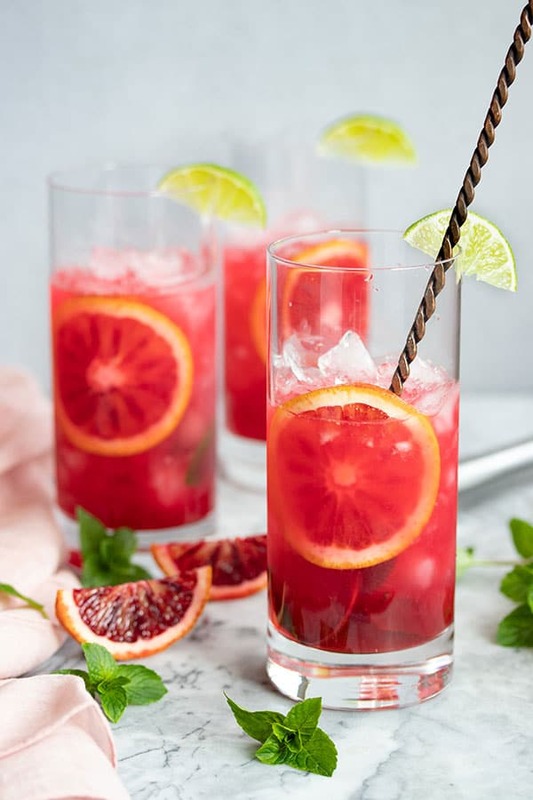 Love a classic mojito but I never have tried a blood orange version before, it looks & sounds so refreshing, citrus-y and fun!